"I was born in the year of the Tiger with a lucky star over my head and a knife in my hand." (p.7) This is how Tan introduces us to her childhood in Singapore. After a childhood of generational intent and dreams, Tan shows a life full of ambition and food. While she was happy to build her life in New York, Tan missed her home dishes even as she learned to appreciate meatloaf and bread. After her grandmother's death, she realizes that she has no concept of the dishes she grew up with and makes plans to spend the next year in Singapore, learning in the kitchens of her aunts and mother. As she learns the family recipes, she also learns details about her family's history. Food is just the beginning as Tan realizes she has so much more to gain than just recipes. 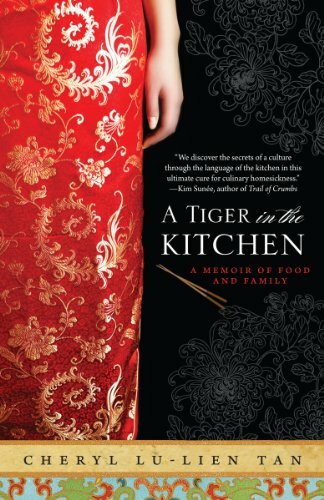 Through failures and successes in cooking, the kitchen becomes a gateway into Tan's family past and a lifeline that connects her in the present. I love culinary memoirs. Tan's descriptive prose of her time in the kitchen, both in her tiny space in New York and in her relatives' spaces in Singapore, drew me in. I got lost not only in her family history, but in the process of cooking. As someone who feels that food is a definite way to connect to family, I really enjoyed the details. Even as she moves back and forth between reminiscing about her childhood and the present day, I had no trouble keeping pace with the story. Fans of Michael Ruhlman's Soul of a Chef or Ruth Reichl's Tender at the Bone should enjoy this memoir, which is a personal journey into Tan's family life and kitchen.